At UOWD we believe in a student-centered approach to teaching and as part of our blended learning program, we host many events that either showcase student talents or bring out the best in students. Mathematics is one such crucial area of focus. At UOWD, we recognized the importance of making learning Math fun in 2006 and began a unique Math competition, called Mathalon, which has been continuously successful in drawing students to compete in a healthy and fun-filled environment. The last day of registration is on 15 November 2018 at 8:30am due to overwhelming response. Please note that all registrations are now closed. Coaches have to remain on campus for the entire duration of the competition and accompany their participants back. * Due to overwhelming response from schools, we are unable to accept any extra coaches. One coach per school per category is the maximum that will be accepted. Paper-based with two sections. Section One – Multiple Choice Questions to be answered on MCQ Answer Sheets with PENCIL. Section Two – Application Questions to be solved with clear steps. All participants will receive e-Certificates of Participation that will be emailed to their respective school faculty representatives after the event, within 2-3 weeks. Each school is allowed to register a maximum of two (2) teams. * Registration is first come, first serve basis. Additional one (1) team may be registered at a nominal cost of AED50/- per student plus VAT. Each team MUST consist of one (1) - two (2) students only. All students registered MUST belong to Grade 11/12/13. Once registered, student/coach names can NOT be changed. Schools are solely responsible for ensuring the spellings of the participating student/coach names are CORRECT on the forms and readable. We regret we will NOT be able to reprint ANY certificates/e-Certificates once they have been issued. Any kind of competition aids such as books, papers, notes, formula sheets are not allowed. Programmable calculators are not allowed. However, teams may bring their own scientific calculators for use. List of acceptable calculator-models will be posted online. All participants bringing in their calculators will have to get them stamped for approval during registration, before taking it into the competition hall. Any participant attempting to communicate with other participants other than their own team member or disrupt the contest environment in any way will be disqualified. The school with the top winning team will receive a Rolling trophy (that will be with the school for the duration of a year and returned to Mathalon Committee for the next year’s competition). Each booth is dedicated to one team of three students only from each school belonging to Grades 9 and/or 10, and a coach. The teams are expected to prepare and present a mathematical concept in an innovative, imaginative and audience-friendly manner. Although mathematics is a subject by itself, we want to go beyond textbooks and classrooms. We want to celebrate Mathematics as an integral part of our daily lives – after all, humans have been ‘counting as a basic necessity of everyday life for thousands of years’ (COMAP, 2017). 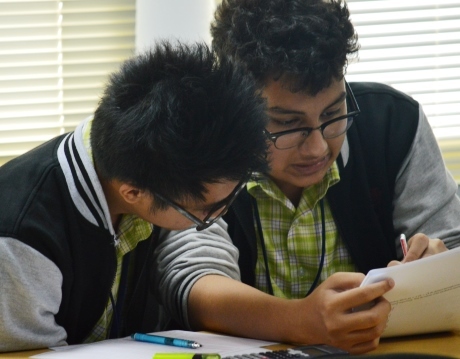 At the MaCoB, we invite teams to select any area of life and demonstrate how mathematics is inter-twined with the selected area. For instance, we all enjoy music. How often do we stop to think about the mathematics behind it? From the notes to rhythm, from scales to intervals, the harmonies, tone, pitch – are all closely connected to, yes you guessed right – mathematics! We invite one team comprising of students from your school’s Grades 9 and/or 10 to prepare a poster/video/visual presentation to be displayed at the booth on the day of Mathalon, November 24, 2018 where we expect more than 150 high school students and teachers to attend. How does your team benefit? Mathalon has been and continues to be a constructive, challenging event for high school students, adding to their college application, making for impressive credentials. MaCoB goes beyond high school grades 11/12 and extends Mathalon to include grades 9/10 to provide them with opportunity to also showcase their knowledge, test their mettle and develop 21st century learning skills such as time management, team work and interpersonal skills. Each student and mentor will receive a Certificate of Appreciation and the winning team voted by the senior teams will walk away with a grand prize. At UOWD we believe in student-centric learning just as much as we believe in community outreach, benefiting the greater community. These are the key objectives that have driven Mathalon all these years. Furthering our objectives, we are expanding the reach of the competition to include Grades 9 and 10, students who are at the cusp of getting to the point where they will begin thinking about further education, subjects that are of interest, and courses that will influence their careers. As strong advocates of STEM and STEM to STEAM education and careers at UOWD, we further aim to open doors of possibilities for young minds to the importance, vitality and expansiveness of mathematics through their engagement in turning theories into practice. Each team MUST consist of one (1), two (2) or three (3) students only. All students registered MUST belong to Grade 9/10. Teams must register and send in the abstract for selection. In the spirit of encouraging learning, all registered teams will be invited to present and prepare their stall on 24 November 2018. We will provide two desks, and four chairs for each team – stall aesthetics is up to the teams. Teams must ensure the project they prepare and present is their research and contribution. Any team found to have copied projects off the internet will be disqualified. Winners will be declared based on the scores attained from judges and senior teams.